A natural, pain-free treatment using Syrinx Za deep cleansing therapy soap and derma protector balm. Seborrheic Keratosis cause hard brown spots to break out on the surface of the skin. The spots are often mistaken for warts, as they’re similar in appearance – but true warts are caused by the human papilloma virus, while keratosis warts stem from over-production of keratin. “I just want to say a big thank you for encouraging me to persevere with the Deep Cleansing & Detoxifying Soap and the Derma Protector because the seborrhoeic keratosis wart I had under my eye, has now completely disappeared. After first visiting my G.P. I was told that there was nothing that could be done to remove it, so I searched the internet for a solution and found the Syrinx Za website and testimonials. I subsequently used the Deep Cleansing & Detoxifying Soap and Derma Protector Therapy Balm to great effect. We recommend you rub the affected area prior to washing with the therapy bar and then putting on the derma protector balm. Our dry skin soap has been praised as a treatment for a full range of conditions, including most types of warts, skin tags and other blemishes. 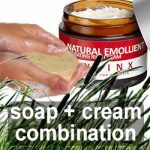 The all natural Derma Protector works with the soap above to boost the skins immune system and remove warts. As a rule, seborrheic keratosis affects people from middle to old age, as the body’s keratin supplies increase. The spots can look foreboding, but they rarely become malignant – even if they start to thicken, darken or turn black. Nonetheless, these unsightly spots can be an irritation – especially if they’re in visible areas, like the hands, arms or face. They can damage self-confidence, often at a time when the body is adjusting to other changes. So you may want to consider options for reduction or removal. Create a lather by rubbing a little warm water into the soap with your fingers. When the lather is rich and thick, gently scrub your warts and the surrounding skin. After cleansing, rinse with warm water. Immediately after rinsing, rub the remaining lather into your warts, using a vigorous motion for at least 30 seconds. Do not dry or rinse off. The soap and Sapropel still have work to do, so leave the unabsorbed lather to dry naturally over the warts and surrounding skin. We recommend that you use the soap in conjunction with our Derma Protector Therapy Balm, containing natural Tea Tree Oil. This balm can be rubbed into the affected areas throughout the day, to nourish and give your skin the best possible chance of a full and rapid recovery. If you follow this routine for 2 weeks, you should begin to see an improvement. For complete wart removal, you should expect 4-8 weeks of treatment – but naturally, it all depends on the size, type and virulence of the warts. If you follow this routine twice a day, the soap will gradually soften the rough surface of each spot. They should start to reduce in size within the first 2 weeks, and over time they should dissolve away. The all natural Derma Protector works with the soap above to boost the skins immune system and eliminate warts. "My skin is so much smoother and some of the flat warts have now disappeared altogether. I love the soap and the balm type cream." mole, wart, skin tag or verruca? Warts are small, rough and lumpy, and usually the same colour as the skin. They’re most often found on the hands and feet, and most are considered harmless. Verrucas are warts that appear on the soles of the feet. Most are hard and white, with a small black dot in the centre. Verrucas are usually flatter than common warts, due to the pressures of body weight. They can be painful, but they’re otherwise harmless. Moles are darker and larger than warts, and can appear on any part of the skin. Smooth and rounded moles are usually harmless, but moles with bumpy or ragged edges could be cancerous – as could any mole that’s growing quickly or exceeding 7 millimetres in diameter. Skin Tags are small growths that look like fat whiskers. If a tag is skin coloured, it's probably harmless, unless it starts to bleed.